One key element to Quasius’ success has been our ability to offer services for our customers with smaller scale building projects. Quasius’ Special Projects Division recognizes that a project’s scale isn’t always in line with its complexity. Maintenance and remodeling are just a few facets of construction that require just as much attention to detail as larger scale projects. Quasius is dedicated to providing high-quality solutions to meet any size job through our Special Projects team by providing timely assessments, estimates, scheduling, and project completion. No job is too small! DOES YOUR PROJECT FIT INTO THIS CATEGORY? Is your project estimated between $1,000-$200,000? Do you consider your project to be maintenance, upgrade, or emergency type work that may not be done by most commercial general contractors? If Quasius Construction’s schedule permits, could we start your project in a week? At Quasius Construction we don’t just pour concrete, lay some bricks, and call it a day. We go the extra mile from the beginning design concepts factoring in time, budget, and feasibility. We’ll even help you select a building site if you’re having trouble on your own, or assist with cost/benefit analysis. We also help you avoid financial pitfalls by identifying cost considerations and avoiding unwanted financial surprises. We’re with you every step of the way, beginning to end! There are a lot of steps that go into getting your project off the ground, and Quasius’ team of craftsmen are experts in each one. 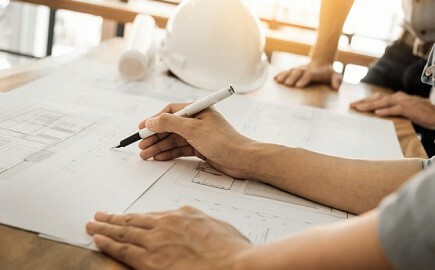 From the initial project concept, to financial planning and through construction, Quasius has project-specific teams that coordinate to maximize efficiency, lower costs, and complete on time. We provide our clients with exceptional value through a balance of productivity and quality. Whatever your project calls for, Quasius has the crew.